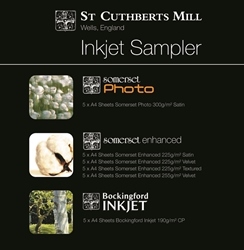 Somerset Enhanced has been created to give artists and photographers an authentic fine art inkjet paper, capable of producing impressive images. This is a stunning matte paper, with an invisible inkjet coating, whose texture will lift images, giving them a beautifully elegant fine art feel. Somerset Enhanced paper is traditionally mould made from 100% cotton, to high archival standards, providing a paper with a genuine heritage. This product has been specially cut to A5 size and is packed in a plain ream wrap. This product has been specially cut to A3 size and is packed in a plain ream wrap. This product has been specially cut to A4 size and is packed in a plain ream wrap.